Sometimes you need to send a message that comes straight from the heart. 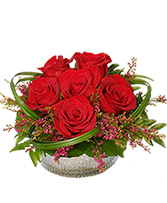 The combination of soft pinks carnations, rich red roses with contrasting white cushion pompon stems delivers the message of "I love you" from deep within each petal. GOOD bouquet is approx. 15"H x 13"W. BETTER bouquet is approx. 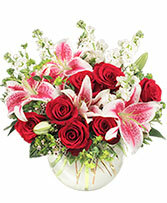 17"H x 15"W. BEST bouquet is approx. 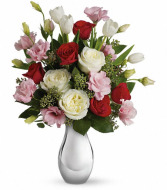 18"H x 16"W.
Tickle her heart with this flirtatious mix of romantic roses, tulips and abundant pink lisianthus. 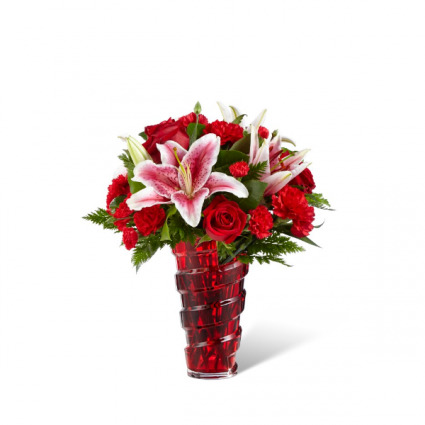 This deluxe bouquet is arranged our elegant Silver Reflections vase. It's a vase she's sure to hold on to - and it'll always remind her of you.